Prytherch explores the evolving principles and practices guiding roadway planning, construction, and maintenance. He traces the role of the AASHTO and other national organizations like the TRB in setting design standards used by federal, state, and local engineers. 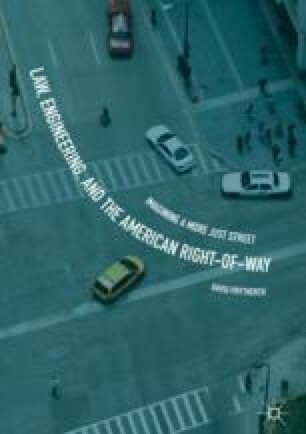 Reviewing for non-engineers the basics of “geometric design,” he analyzes how social and legal assumptions about proper users—so-called design vehicles—are manifested and reinforced in guidance for the three-dimensional design of streets. The chapter also explores how the Highway Capacity Manual defines the quality of roadways as “capacity,” formalized in standards like level of service (LOS) that grade streets and intersections in terms of uninterrupted flow. This analysis highlights the central role of such design practices in literally constructing everyday roadways as spaces of vehicular speed and throughput, often to the detriment of wider place functions and livability. ———. 2017. History of the National Committee on Uniform Traffic Control Devices (NCUTCD). http://www.ncutcd.org/Documents/About%20Us/History/History-052017.pdf. Last Accessed June 23, 2017.